Thomas Edwin Mix (born Thomas Hezikiah Mix; January 6, 1880 – October 12, 1940) was an American film actor and the star of many early Western movies. He made a reported 336 films between 1910 and 1935, all but 9 of which were silent features. He was Hollywood’s first Western megastar and is noted as having defined the genre for all cowboy actors who followed. 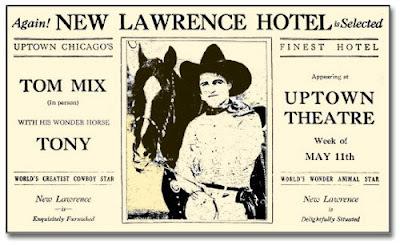 And in May (year unknown) he and his horse Tony visited Uptown Chicago, as evidenced by this vintage newspaper advertisement. Tom Mix and his Wonder Horse....very interesting. I wonder what tricks the horse did? Where was the "New Lawrence Hotel", is it still standing? The advert says it was "Delightfully Situated". I love the way they used language back then. It's now the Lawrence House at Lawrence and Kenmore. You can see a few old postcards of the exterior here: New Lawrence. Thanks Joanne. That was my first guess. Surprised it had an indoor pool, would be nice to see the rooftop garden come back, that was ahead of its time. Unfortunately from what I hear it may still have the original plumbing...still a beautiful building.